Thanks for looking. Any comment is welcomed. Canon 7D II. 300 mm. F/8. 1/640: ISO 400. Beautiful shot. Sharp bird, nice pose and framing, attractive perch, great bg, and the rain to add even more interest! Oh, and great lighting, too. Wonderful! A lovely image! 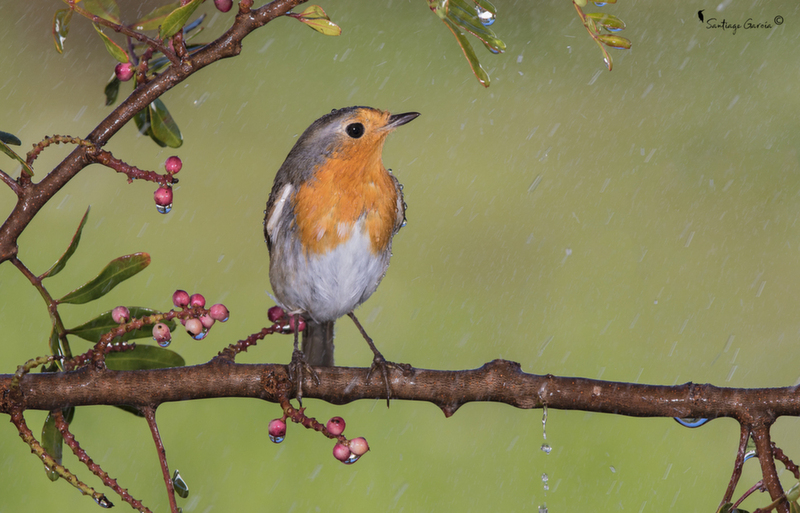 The angled rain creates a great mood for the image, and the fact the Robin is looking into the rain adds interest. Well done! I love this image. Everything said above I totally agree with. Only question is whether or not it is really a Robin. Looks like a female Bluebird to my eye. Santiago, This Robin looks a bit different than the Robins in North Texas. Agree with the others about the image. It is excellent. Curious, did you use any flash? Sorry for not specifying it. It's an European Robin. This shot was taken in Spain. I've used two flashes, Gene.